Bloglines is a popular feed reader. There are about 83K publicly listed users on bloglines and they have a combined 2,786,687 feed subscriptions. Roughly 35% of these publicly listed users organize their feeds into folders. On an average there are about 20 feeds per folder. By analyzing this data and combining merging folders that are very similar, we have come up with an automatic way of creating a taxonomy of popular topics and make it easy to find feeds that are most relevant to that topic. 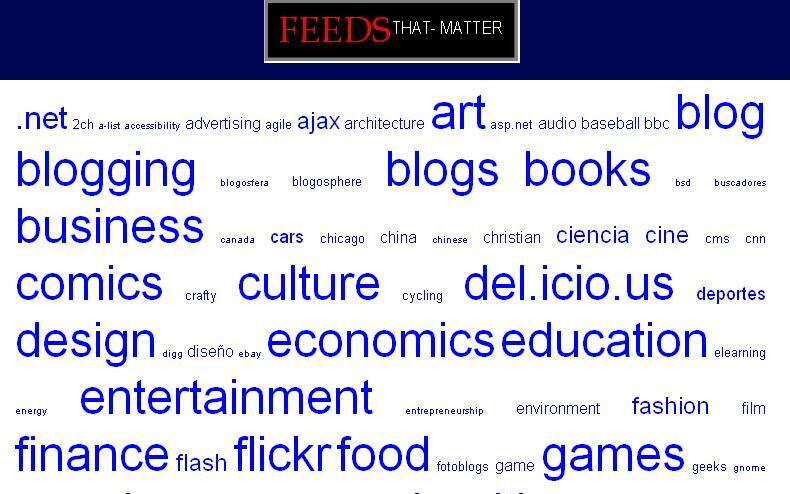 Folders are organized in a tag cloud with top feeds listed within each. There's apparently a recommendation engine, but I couldn't find it. Interestingly, Blogspot contributes 45% of the blogs that matter. 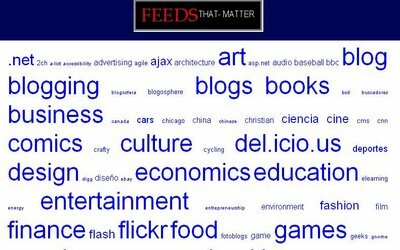 There's a limit to the number of feeds any user can keep track of (most subscribe to 30-100 feeds), and Feeds that Matter looks like a useful way to find out which ones are worth your time.